1 Day Sale Only. Limit 1 per customer. Our largest and most magnificent Christmas Train that we carry, built extra sturdy and great for both indoor and outdoor display use! 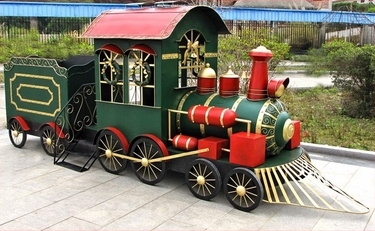 This Green, Red & Gold Metal Train is a huge eye catching display, full size fun and featuring beautiful focal points and elegant scroll work, with plenty of room for sitting or presents in the large included tandem Cart. Makes for a great photo opportunity during the holiday season and beyond, to celebrate Christmas, and every other moment for train aficionados and locomotive lovers. Stands 200" Long x 56" Wide x 76" High. Kids love getting their pictures taken in the cart. Perfect for anyone needing serious Christmas spirit!